While in Pensacola we enjoyed a great morning at the Naval Air Station. We went to the National Naval Aviation Museum. It is FREE admission and has planes, special exhibits, simulators and a nice kid's play area. They also have a FREE 45 minute trolley tour to see other aircraft outside. We did not have time for the trolley ride, but we did get to go inside the new hangar bay which had Vietnam era aircraft as well as a Marine One Presidential Helicopter. The Pensacola Lighthouse and Fort Barrancas on the naval base as well. You do need to make sure you watch the signs when driving on the base because there are areas where visitors are strictly prohibited. You also need to show ID to enter. Our oldest daughter and I wanted to see penguins. Riverbanks Zoo & Garden in Columbia is one of the zoos in the U.S. that has penguins and we couldn't pass up an opportunity to go while we were in town. Once again, they are part of the AZA reciprocal program, so we saved $60 and got in for FREE. Can't beat those savings! The penguins were being fed when we entered the Birdhouse where they are housed. It was fun to watch them swim and burst out of the water onto the land when they are done. We also saw the Koalas again and one of them was holding a baby on their lap while they both slept. They have a new Kangaroo Walkabout where you can walk through and there is nothing between you and the kangaroos. There are a couple other zoos in IL and OH that also have walkabouts. Riverbanks also has gorillas, baboons, African elephants, Komodo Dragons, giraffes and many other big and small animals. We went to North Carolina to revisit some places we used to live. It is always interesting to go back to places that were part of your past. Our oldest was born in North Carolina and lived there until he was two, so we like to take him back and remind him of people and places he used to know. When we lived in North Carolina we were introduced to Hibachi cooking and a wonderful thing called Shrimp sauce. We moved to Maryland and the Hibachi restaurants near us did not use shrimp sauce, so we love to eat Hibachi when we are back in North Carolina (or other southern Japanese restaurants that have shrimp sauce). We are not "beach people." We may go to the beach, but we don't live at the beach. For eight years we lived about 30 minutes from the ocean, but we only went there a couple times a year to swim and sit in the sand. We are a fair-skinned family of redheads. Our children love to play in the sand, but would prefer a pool over the ocean. I love to walk on the beach or just sit by the water and read, but with four kids neither of these are easy to do right now. Columbia, SC is a city full of things to do. But, we headed out of the capital city to visit Hilton Head Island. It's about a three hour drive. 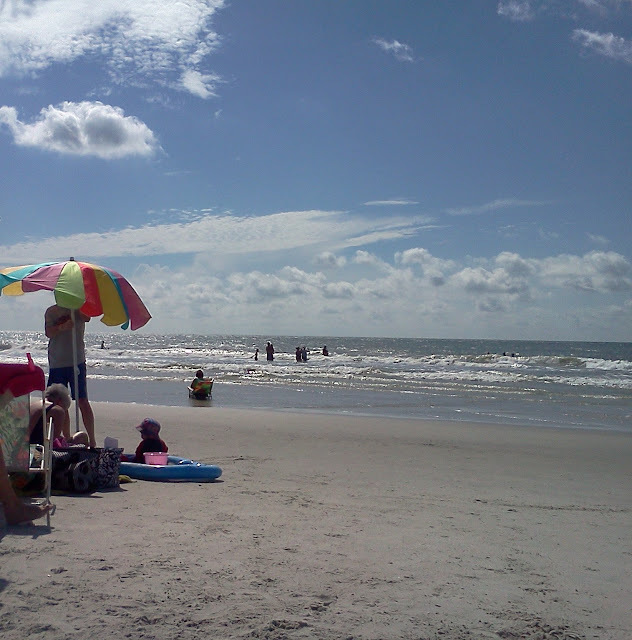 I've been to Myrtle Beach several times, but this was my first visit to Hilton Head. We got there Thursday afternoon, so after meeting up with my sister-in-law and her family, we headed to Jarvis Creek Park. They had a nice playground, picnic areas, paved trails, a pond and plenty of shade. There was also a dock where you could fish. Of course, I went to see the alligators. We saw two small alligators as well as lots of turtles and a large bird that didn't seem to care about the turtles or gators that were swimming near its perch. It was quite evident we needed to slow down after the hectic pace we had been keeping on this trip. We are over half-way through, so the late nights, busy days and different eating habits is beginning to affect our attitudes and bodies. So, we got up and relaxed at my in-laws home. The kids were excited to play some video games, checkers with grandma and try out their new scooters on some walks around the neighborhood with their grandpa. 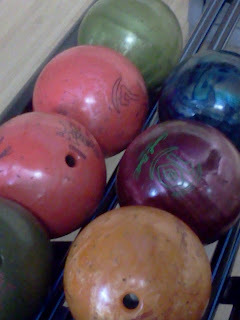 But, since I am not one for sitting around the house all day long, we decided to go bowling. Our family of six went to Columbia Lanes, an AMF bowling alley, and played two games a piece for a total of $8.10. Would you like to know how we went bowling for so little? We had another long day of driving. We left the Eastern Shore of Maryland, traveled south through Virginia, across the Chesapeake Bay Bridge-Tunnel and stopped to visit a cousin in Portsmouth. I wish we had time to explore Portsmouth further. I saw lots of neat shops and a sign for a children's museum that was hard to ignore. We enjoyed a couple days in Salisbury/Fruitland, MD where we lived for eight years. It was nice to visit and already see changes in the last year. Since we had only a short amount of time, we spent most of it seeing family and friends in the area. My parents and children did take a walk through the city park and FREE Salisbury Zoo. Our 7 1/2 year old daughter agreed to be the photographer in my absence. Day 14: Delayed in D.C.
We have made many trips to Washington, D.C. When we lived two and a half hours from the New Carrollton Metro Station it was a nice day trip option. We have been to the National Zoo, the Smithsonian museums, the monuments on the Mall, Jefferson Memorial, the Holocaust Museum, Arlington National Cemetery, the National Archives, the National Gallery of Art and Ford’s Theater. During a father-son weekend, my husband and oldest son visited the Spy Museum (admission costs), saw the Pentagon and FBI building from the outside (found out you can’t take pictures of the Pentagon) and saw the Iwo Jima Memorial at Arlington. The great thing about D.C. is that so much of it is FREE.